I have no idea what just happened. And I suspect that’s what Calvino was aiming for. Each year in the course of my travels I stop at Procopia and take lodgings in the same room in the same inn. Ever since the first time I have lingered to contemplate the landscape to be seen by raising the curtain at the window: a ditch, a bridge, a little wall, a medlar, a field of corn, a bramble patch with blackberries, a chicken yard, the yellow hump of a hill, a white cloud, a stretch of blue sky shaped like a trapeze. The first time I am sure there was no one to be seen; it was only the following year that, at a movement among the leaves, I could discern a round, flat face, gnawing on an ear of corn. A year later there were three of them on the wall, and at my return I saw six, seated in a row, with their hands on their knees and some medlars in a dish. Each year, as soon as I entered the room, I raised the curtain and counted more faces: sixteen, including those down in the ditch; tewnty-nine, of whom eight were perched in the medlar; forty-seven, besides those in the chicken house. They look alike, they seem polite, they have freckles on their cheeks, they smile, some have lips stained by blackberries. Soon I saw the whole bridge filled with round-faced characters, huddled, because they had no more room to move in; they chomped the kernels of corn, then they gnawed on the ears. And so, as year followed year, I saw the ditch vanish, the tree, the bramble patch, hidden by hedges of calm smiles, between round cheeks, moving, chewing leaves. You have no idea how many people can be contained in a confined space like that little field of corn, especially when they are seated, hugging their knees, motionless. They must have been many more than they seemed: I saw the hump of the hill become covered with a thicker and thicker crowd; but now that the ones on the bridge have gone into the habit of straddling one another’s shoulders, my gaze can no longer reach that far. This year, finally, as I raise the curtain, the window frames only an expanse of faces: from one corner to the other, at all levels and all distances, those round, motionless, entirely flat faces are seen, with a hint of a smile, and in their midst, many hands, grasping the shoulders of those in front. Even the sky has disapperared. I might as well leave the window. Not that it is easy for me to move. There are twenty-six of us lodged in my room: to shift my feet I have to disturb those crouching on the floor, I force my way among the knees of those seated on the chest of drawers and the elbows of those taking turns leaning on the bed: all very polite people, luckily. ← I want to talk about something other than books! 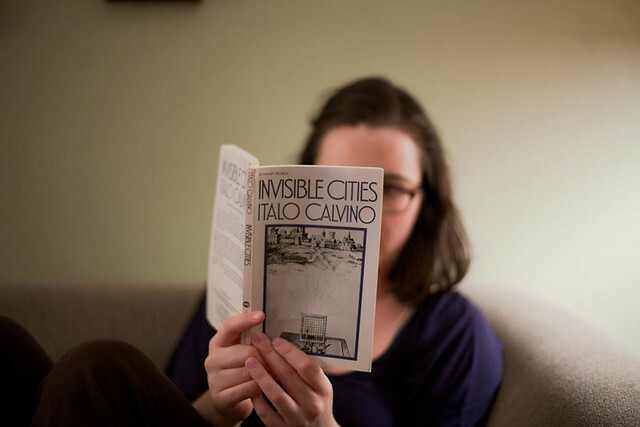 Do you like Calvino? I can never quite decide what I think. I haven’t read “Invisible Cities,” but have read other bits of his work. I oscillate between enjoying what I’m reading, wanting to throw the book across the room in frustration, being sad for the state of human affairs, and probably numbers of other emotions…. By the way, I’m impressed at your reading this month as chronicled here. You’re so speedy!! :) And you’ve picked some good books too. Ah, I love Calvino. “Baron in the Trees” is my favorite.